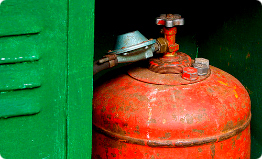 Home>Articles>Gas tank and gas cylinder: what is more dangerous? Only gas cylinder might be dangerous. It doesn’t have security valve. 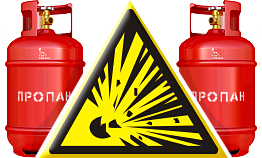 The possibility of gas cylinder explosion is high. Getting into fire zone cylinder for gas storage explodes, causing a great damage - tearing everything down. But here you should remember that it’s not gas which explodes but the cylinder itself. That is why according to fire security norms gas cylinders should be kept only outside, in ventilated metal box. Cylinder assemblies installed inside the room is violation of fire safety rules. This is strictly forbidden! Contrary to gas cylinder independent has tank doesn’t require special protective boxes and has electromagnetic secure valve. Gas tank is situated under the ground (in sand lock) and under pressure what excludes any fire source penetration inside. In case of fire (there was a case of turfary inflammation) warming-up cistern empties liquefied fraction into the air becoming completely safe. Bulb ignites but doesn’t explode.